This Lemon Elderflower Cake is my copycat version of the royal wedding cake! Elderflower infused lemon cake layers with lemon curd and elderflower buttercream. I am so excited to share this cake with you today, as it’s my version of Prince Harry and Meghan’s wedding cake. 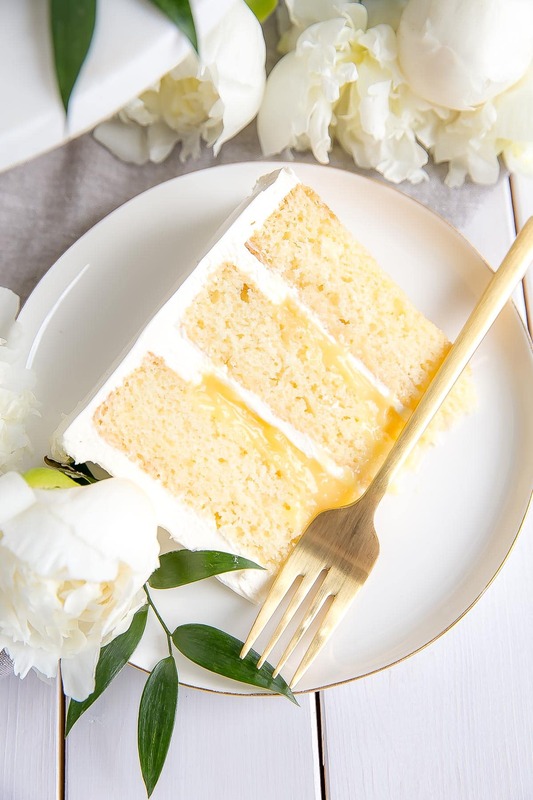 This Lemon Elderflower Cake was heavily inspired by Claire Ptak at Violet Cakes in London, who made the actual royal wedding cake for the couple. I found out about the flavours shortly before the wedding, and was inspired to create my own version of it. Any excuse to make a cake and try something different, right?? The cake consists of lemon infused cake layers, an elderflower syrup, lemon curd, and an elderflower Swiss meringue buttercream. Maybe I’m living under a rock (likely) but I actually hadn’t heard of elderflower until recently. I was actually shocked to find elderflower cordial in the first grocery store I checked. Usually I’m traipsing all over the city and back to find certain ingredients, only to give up and order them online, so to see it right there on the grocery store shelf was nothing short of a miracle. Elderflower cordial is very floral, with an almost citrusy aftertaste. It goes really well with lemon, and is just perfect for the spring/summer season. For the lemon cake, I used the same recipe I used for my Lemon Blueberry Cake, but scaled it up for slightly thicker layers. For the lemon curd, I modified a recipe we used in pastry school (it’s SO good omg). Those went off without a hitch, but I made a couple of mistakes working with the elderflower cordial. Initially, I made an elderflower syrup by bringing 1/4 cup water and 1/4 cup sugar to a boil before stirring 2 Tbsp of elderflower cordial into it. This tasted delicious, but once used on the cake, the elderflower was overpowered by the lemon flavours. The cordial itself is actually already a syrup (since you’d need to dilute it to use in drinks, etc.) so I should have just used it straight up. You can choose to do it either way though. Speaking of drinks.. as I was working on this Lemon Elderflower Cake, I found out there’s actually an elderflower liqueur too! What to do?! You know I love to booze up my cakes here and there, so I was so tempted to try this instead. A quick Google search led me to a $50 price tag though… yikes. Nevertheless, I set out to find it. I didn’t really try that hard though: I checked one liquor store and they didn’t have it, so I decided to move on. I already had the cordial, and I didn’t need to spend money on liqueur that will literally just sit in the cabinet after (I pretty much only use it for baking). 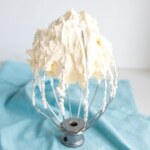 The second issue I had with the elderflower is that, in typical Olivia fashion, I forgot to put it in the buttercream!! Thankfully, I realized this after the crumb coat, so I added it in then. There’s lemon curd between the layers instead of buttercream, so it wasn’t too bad, but STILL. I need to be more organized. I always write down the recipe, but never actually refer to it while making the frosting! How much elderflower you add to the buttercream is really to your taste. I found it to be quite subtle, but some can find it overpowering. However much you add, be sure to do it slowly (1 Tbsp at a time) and stop if it feels like you’re affecting the texture of the buttercream. I’ve been able to add up to 1/4 cup of liquid to buttercream without affecting it, but just something to be aware of. I waited until after the wedding to make the cake, as I wanted to see how it was decorated so I could emulate that as much as possible. There’s a lot of mixed feelings out there about the cake, but I think it looks beautiful. I love the rustic elegance to it — the juxtaposition of the ornate gold stands with the rustic flowers and frosting. Decorating this cake was fairly simple. It was SUCH a relief to not have to worry about perfectly smooth frosting and sharp edges. It really was one of the easier cake frosting techniques I’ve tried. To be fair though, it’s possible I totally lucked out and it just worked on the first go around. I am super pleased with the results. I was also lucky enough to find peonies in the exact color I was looking for. In the first flower shop I went into!! High fives all around. I ended up spending $60 on peonies though, which is sort of ridiculous. Good thing I passed on the liqueur! Overall, this Lemon Elderflower Cake turned out better than I expected, both in flavour and aesthetic. It was easy to decorate, and I think it looks stunning. I can see why Harry and Meghan chose this style and flavour combo for their special day. I recommend not diluting the elderflower cordial for the cake layers too much (or at all), or you’ll lose the flavour. The amount of cordial you use in the buttercream is up to you. Only add it 1 Tbsp at a time though, and add to taste. Bring 1/4 cup water and 1/4 cup sugar to a boil, simmer 1 min. Remove from heat and add in 2Tbsp of St. Germain. Cool completely. Be careful about putting too much lemon curd in between the layers. This can make the cake more unstable. Regardless of the amount of lemon curd, you must do a dam of frosting around the perimeter of each layer to hold in the curd. This is not optional! You will have some curd left over which you can freeze if you like or use in another dessert. The buttercream recipe makes enough to fully frost the cake (if you weren’t using curd). You can freeze this as well if you have extra or just reduce the recipe slightly. 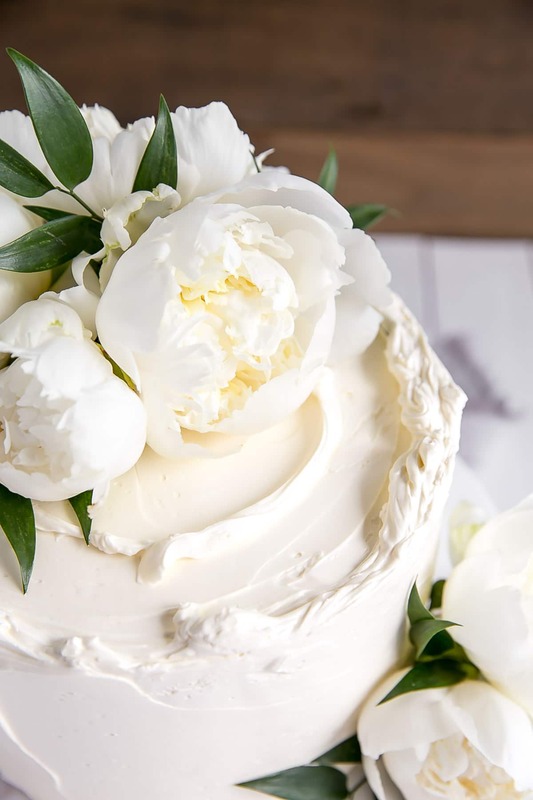 If you use fresh (non-edible) flowers like I did, be sure to protect them from the cake (I used floral tape around the stems). Using a stand mixer fitted with a paddle attachment, cream butter and lemon zest until smooth. Add sugar and beat on med-high until pale and fluffy (approx 3mins). Alternate adding flour mixture with milk & lemon juice, beginning and ending with flour (3 additions of flour and 2 of milk & lemon juice). Fully incorporating after each addition. Place eggs and sugar into a small pot, whisk to combine. Add lemon juice, zest, and butter. Cook over medium-low heat whisking constantly until mixture thickens and coats the back of a spoon. Transfer to a glass bowl and lay plastic wrap directly on surface to prevent a skin from forming. Chill for 3 hours to set. Makes 2 cups. Add 2-4 Tbsp elderflower cordial (to taste) one Tbsp at a time whip until smooth. Spread a thin layer of buttercream on top of the layer and pipe a border around the outside to hold the lemon curd in. Fill with approx 3/4 cup of lemon curd. Repeat with next layer. Frost the top and sides of the cake with remaining frosting in a rustic manner. I started by spreading a generous amount of buttercream on the top and letting it overhang on the sides. Then I used a flat spatula to add buttercream to the sides of the cake and to smooth the which created a top lip with the overlapping buttercream. Top with fresh peonies if desired, but be sure to wrap the stems in floral tape. *** You can dilute the cordial if you like, by adding it to some simple syrup. Hello. I am looking forward to trying this recipe out. I am a huge lemon fan, and just today I picked up a bottle of Elderflower Cordial. Intrigued since Harry and Meghan’s wedding, I am anxious to try your verison. Question: I have made a lot of lemon curd, but my recipe calls for cornstarch. I notice yours does not (no biggie), but, yours calls for “eggs”, not just the yolks. So you really use the whole egg in making curd, not just the yolk? Wanted to make sure before I take the plunge. Thank you. And…if making American Buttercream, can I use the same amount of Elderflower you suggest for your Swiss? Hi Paula! I use whole eggs in my curd recipe simply as a preference. It does make the curd a little bit softer though which can be tricky to work with (soft/slippery — be sure to do a buttercream dam and not fill with too much curd). Feel free to use any curd recipe you like though. Let me know how it turns out! This is such a great recipe! I wanted to make this for my wedding in June and the test bake was a big hit with everyone! 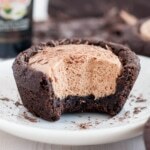 I’m wondering if you have recommendations for making this recipe in a mini cupcake or tray-bake form? I’m making the full recipe for my wedding day but would love to serve mini bite-size versions at my backyard reception. Hi Lauren! So glad you like this recipe — it should work in any form, you’d just need to adjust the baking time accordingly. For cupcakes I recommend checking them at 15mins or so to see how they’re doing. I would like to make this cake for a wedding in June. The cake will be 4 tiers. The largest 12”. Was wondering about the mixing time of the cake batter. When I make a cake from scratch I always have trouble with the baking time. To much it’s gummy and heavy. Any suggestions on beating times. Also, is this cake string enough to be made in to a 4 tier cake. Hi Cynthia! Provided you use proper supports for the cake, it will work fine as a 4 tier. For the mixing you want to make sure that you don’t mix too much once you start adding the flour. Overmixing develops more gluten and makes for denser cakes. I mix the bare minimum and often fold in the last bit of flour by hand. I hope this helps! Thank you for sharing this beautiful delicious cake recipe. Just pay attention and follow the directions, you can’t go wrong with this outstanding cake. You share so many helpful details in all your recipes so home bakers can successfully make fabulous cakes that taste wonderful and look gorgeous. I always turn to your recipes when I want to make a cake that matters. Hi Elaina! Thank you for the sweet comment. I’m so glad you like this recipe and others! Hi I live in the Uk and have tried this cake (dummy run) and love it. I am attemting this cake for my daughters wedding in July. I want to make different sizes and depths , same as Harry and Meghans cake. q1. Is it just a matter of putting this mix into different size and depth cake tins? q2 Can i complete the cakes ie. fill them and buttercream them and then freeze , say 2 weeks before the wedding and then get out the day before the wedding to take to the venue. As for freezing, that should work totally fine. As long as you have room in your freezer and the cakes are properly covered as not to take on any freezer smells. Hi, I was wondering if I’d be able to make this cake in three 6″ pans? And would you have an idea how I will adjust the recipe for that? Your cakes look amazing. Thanks for sharing your recipes and tips. Your blog inspired me to finally try baking cakes. 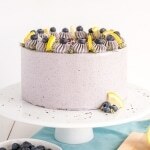 Will bake the banana-blueberry cake this weekend! Hi Kim! That is awesome, I’m so glad you’re stepping into the cake world! Adjust the Servings down to 12 and you’ll see the amounts for three 6″ pans. Baking time may vary slightly. Let me know how it turns out! Just wanted to give some quick feedback I baked the cake part tonight. I first tested with a toothpick at 20 minutes and it pulled out clean but it was very achy looking and didn’t spring back it clearly wasn’t done. Kept checking and pulled it as soon as I possibly could even though it got browner than I wanted and dark around the edges. I didn’t notice The fact that there’s a converter between volume/weight and there is a discrepancy. I weighed my flour which is 360 g, but the recipe Given in weight is actually 375. So the recipe states 3 cups of flour when it’s really 3 1/8 cup of flour. This may be the issue people are having. I should not have skipped the parchment circles. Normally I don’t need to do that, but in this case you really do. The cake stuck to the bottom and tore apart. I think I can salvage it by freezing before icing. Won’t know till tomorrow if it’s dry or unsavagable. Thank goodness I don’t have to deliver till day after tomorrow. Hi Maria! The mertic conversions are done by a tool automatically, I don’t verify these myself. I don’t think that amount of flour would have made much of a difference, but thank you for pointing that out, I’ll update it! I did save your cake and doctored it with a little bit of lemon syrup as well as the elderflower syrup because I feared using too much elderflower. Filled it with more curd and iced it with the elderflower syrup for flavoring. Tomorrow the whole neighborhood is going to eat that one! I’m not sure what I could’ve done to save the cake as written. It was eggy and too soft to pull from the oven without collapsing before it dried out. I’m thinking maybe if you are overseas, I’m in the US, maybe the four there has more/less protein than ours? I don’t know. Hi Maria! Awesome about the cake taking the second highest bid! I’m in Canada, so I think our flour would be similar. What kind of flour did you use? The cake being eggy and fragile leads me to believe it was overmixed. Is that possible? It really should not be eggy, or dry, or collapsing. Did you make any substitutions to the ingredients? It really sounds like something was way off. I made this cake for my friend’s 40th and it was a huge success! Delicious! The only thing I wasn’t completely happy with was that my buttercream was very yellow. I added a little blue colouring but that didn’t seem to help. I’m going to make it again for a baby shower – have you got any further tips about how I can make the buttercream white? Hi Louise! The buttercream can be tricky to get lighter — is your butter more on the yellow side? That can make it harder to neutralize. As for tips — be sure to whip it for a good bit on med/high after you add the butter (about 5mins). That will help lighten it. Another route you can take is to whip the butter first in a separate bowl so it’s more pale, then add it by the Tbsp to the meringue. You’ll likely still need to add a bit of blue to get it whiter still, but that should help! Hi Brett! Sounds like a good plan, let me know how it goes! * If I want to make a bigger cake, is it as simple as doubling the ingredients? * I saw in your Swiss meringue butter cream recipe you can make that in advance. What about the lemon curd? How long does it last after making? * I only have one cake pan, is it possible to bake one by one? Apart from the fact that it takes much longer time? How long does these cakes last? Hi TC! Yes, you can double the ingredients — for ease you can adjust the Servings and it will automatically adjust them. Lemon curd can be made in advance as well. It freezes well or will keep in the fridge for a week or two. If you only have one pan, I would adjust the recipe and do it in batches — one at a time. It’s not good t let cake batter sit out. I made this cake last night. Delicious flavors but the cake part is really dry. I didn’t want to add much more syrup and risk an overpowering flavor. Any suggestions for a moister cake? Hi there! So glad you liked the cake! Is it possible it was overbaked? It should not be dry, especially with the syrup! Every oven bakes a bit differently, I suspect it just needed less baking time. Let me know if you try it again! I made this cake for my daughters birthday. It was just delicious. So easy to make. Turned out perfect. For the butter cream I did a combination of elderflower cordial and liquor. It worked a dream. The best part was I didn’t have to trim the cakes. They cake out beautiful and flat. I will be making this again. This looks great! I’m hoping to alter it to be a lemon lavender cake instead – steeping the milk with dried lavender and opting out of the elderflower syrup. Without the syrup, will the cake still be moist enough? Any tips would be great. Thanks! Hi Aislyn! I think it would be fine, but you could also just do a simple syrup with just the sugar and water to add extra moisture. do you think i could use homemade edelblower syrup instead cordial? 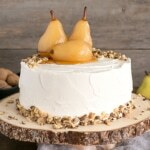 plan to make this cake for my friends wedding and am bit anxious! I’ve made this cake 4 times and EVERBODY who tastes it loves it. My sister calls it the”Heaven Cake” my oldest daughter who doesn’t even like cake LOVES it! Even my 3 small Grandsons ages 5, 4 and 2 go crazy over it. A busting British friend asked me to send the recipe to his daughter in England. This cake is worth all the time and effort to make. What I would like to know is if I halve the recipe could I make a smaller version? A smaller version would make a wonderful little hostess gift. Hi Susie! Seriously high praise here! So glad everyone loved it 🙂 You can totally halve the recipe — just change the servings to 8 see the proper amounts. That would work as a three layer 6″ cake. Thanks! That’s what I’ll do! Maybe it’s me! Thank you Betty Crocker! Hi Emad! Sorry to hear you had trouble with this recipe. Did you make any substitutions to the ingredients? If the cake came out tough that could be due to too much flour and/or overmixing the cake batter. If the buttercream was too soft you should refer to my tips here to see why and troubleshoot. For the curd, it’s possible it needed to be cooked longer if it was too runny. Regardless though, you’d need a buttercream dam (per my instructions) as the curd would never be strong enough to support the layers. I made this wonderful cake for a birthday party…it was lovely and everyone enjoyed it. I served it on a silver tray. Thank you for a fantastic, light and flavoursome cake. I just have one question about the milk and lemon juice! Do you add them together and them alternate them eith the flour, or alternate all three ingredients? Hi Jean! I alternate all 3. If you add them together the milk and lemon juice will essentially make buttermilk, so I like to keep them separate. I’ve tried making this cake twice and it’s flopped both times! The batter is beautiful – and tastes delicious – but the cake is dry and so delicate that I cannot turn it out despite well greasing the pans and using bake-right strips. I used a spoon to place the flour in the measuring cups. Any thoughts on what I could be doing wrong? Hi Angela! The cake should not be dry, especially with the syrup and lemon curd. Is it possible that it’s overbaked? Or is there a chance you overmixed the batter? Hello, Olivia! Thank you for posting this recipe. The cake looks really gorgeous and the flavors suit each other really well. Do you recommend making the cake, lemon curd and buttercream all the same day or an amount of days before? If so, how many days before? And also, do you have to necessarily use a stand mixer with a paddle to mix some of the ingredients together? (I have a hand mixer at my disposal) And perhaps a wooden spoon would suffice for the stand mixer’s paddling? Would it make a difference? Hi Peigi! You can make everything in advance and freeze each component. For the Cake: Cool the layers, double wrap in plastic wrap, freeze for up to 3 mos. Take out 2-3 hours before assembly. For the Curd: Cool completely and place in an airtight container with plastic wrap directly on top. Refrigerate for a week or freeze for up to 3 mos. For the Frosting: Place in an airtight container and refrigerate for 1 week for freeze for 3 mos. Bring to room temp and rewhip before using. It will be difficult to make the frosting without a stand mixer. It’s doable, but you’d be whipping for a LONG time by hand first to cool the meringue and then once the butter is incorporated. The cake will be fine with a hand mixer though. Let me know how it turns out! Thanks again! This cake came out perfect! I made for a special birthday and it was a hit! I did variate a couple things though. I kept a watchful eye on the cakes while they were baking and instead of cooking them for 35 minutes, I ended up cooking the cakes for 25 and they came out moist and perfect. I guess that is because everybody’s oven bakes differently. When I was whisking the egg whites and sugar on the double boiler, it took longer than 3 minutes to be “no longer grainy to the touch”. I estimate it took about 12 mins. Otherwise, I followed everything else in the recipe. Hi Peigi! Yay! I’m so happy you liked it! I’ve clarified the instructions for the egg whites & sugar. You place the bowl directly over a pot of simmering water, not over a pot on a pot. Sorry that wasn’t clear. I’m so glad it worked out for you though! Just a quick question about freezing this cake..
Do u freeze after the cake is coated with elderflower cordial? Hi Shabeen! I soak with syrup after the cake is thawed. I hope you like it! Hi Liv, thanks for the delicious recipe! 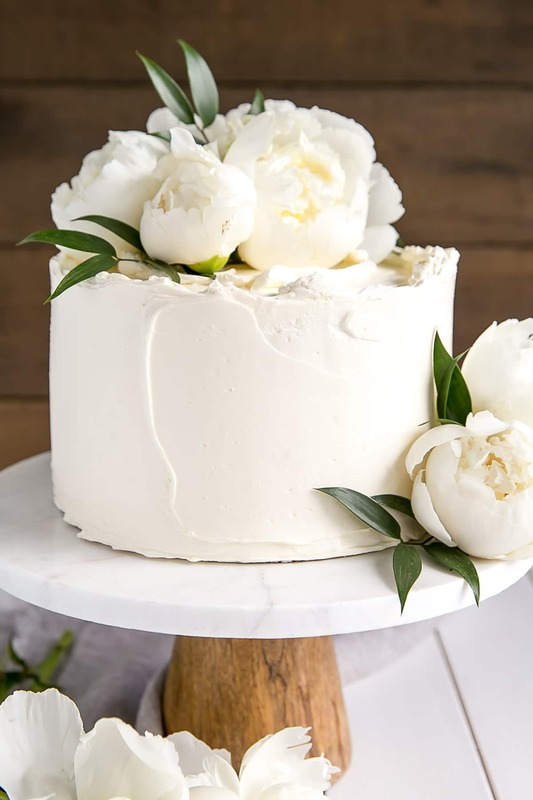 I want to use it for a 3 teir wedding cake, do you think the texture would be allow it to be stacked into 3 teirs as it is is so lovely and light and fluffy I don’t want to ruin it and make it sink!! Hi Fran! As long as the tiers are properly supported with dowels or similar, it should be fine! Thanks Liv, can’t wait to try! I used your lemon cake recipe to make cupcakes today. O.M. G. The batter was so good I was afraid I wouldn’t have enough left to actually make the cupcakes. I can’t wait to do the icing tomorrow! Hi Beth! So glad you liked it! Hi Olivia, going to make this cake for my daughter s 21 st. just. Wondering wether I can use “Wilton white white icing colour ” to make butter cream white? Hi Nishanthi! You can try that for sure, but I would actually start with adding the tiniest bit of violet color gel to the buttercream first. The violet will counteract the yellow, but be sure to add it little by little with a toothpick. Finally I did the lemon elder flower cake for my daughter s 21st. and came out very well. Super yummy. Everyone went for the second serve. Thank you so much for your recipe. Nothing went wrong and big relief for me who is not a professional cake maker . Didn’t add any colour to make butter icing white. Just added extra 4 egg whites. So happy to hear that!! Glad it all went well and that everyone loved it. I made it for a wedding shower at work. The cake did not rise much so I was nervous if it turned out okay. This cake was a big hit at the office! One of the guys said it tasted as good as it looks actually even better than it looks. 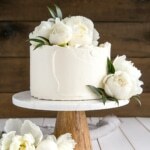 I double the recipe and made a 2 tier 8”(4layers) & 6”(3layers) cake and added fresh blooms. I made cake 2 days before the shower. 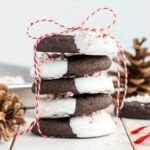 Wrapped with Saran Wrap and put in frig, then frosted the next day.This recipe is a keeper! Hi Lu! So happy to hear that you liked it. Thanks for your tips! Hi Olivia I would really like to add some poppy seeds to the sponge and was just wondering if that would change anything in the recipe and how many grams of popy seeds i should add in. Hi Emily! I think poppy seeds would be a delicious addition. I would try maybe 1/4 cup (or 25g), but you could add more/less if you like! Hi Olivia! this looks amazing and I can’t wait to make it. Can the recipe be doubled? I saw your Joy of Baking link about sizes but it doesn’t talk about actually doubling recipes. Hi Alelia! Doubling this recipe should be fine! Thank you for sharing your recipe. It came out very well. I altered my recipe a bit. I didn’t have elderflower syrup so I used orange blossom syrup. And I used a bit less sugar in my cake. I also put fresh raspberries in the center. Do you have a picture after cutting into the cake? I’d love to see the inside! Is it like a sponge cake? A lot of the recipes I see are sponge. Hi Tammy! There is a cut slice picture in the post. Hi! I was wondering what size and how many cake rounds you used for this cake? Also, I’m making this cake for my 1 year old daughter’s birthday. Can a one year old consume elderflower? 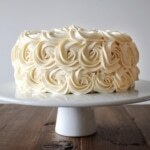 Will the swiss buttercream hold up enough to make a rosette cake? Hi Katelyn! All of the details are in the recipe — I used three 8″ pans. I’m not sure re: elderflower so I would google that to be sure. The buttercream will hold up fine as rosettes! Hi Olivia, I’ve just stumbled upon your recipe and I’m keen to make it for my daughters christening this weekend (I love the Royals and have needed an excuse to make a replica wedding cake!). The christening is on Sunday – how many days can I bake it in advance so it’s still fresh? And is it best to sandwich the layers together and frost on the day it’s to be eaten, or can this be done the day prior? Thanks! Alex 🙂 PS – I’m in New Zealand and have read the comments about the different flours. We have high grade flour and plain, no idea what the difference is but I expect its to do with gluten content. At any rate I will use high grade and hopefully it’ll work! Hi Alex! The cake layers can be made in advance, cooled, wrapped in plastic wrap, and frozen until you need them. Otherwise they’ll stay fresh for a day or two in the fridge (not longer as the fridge tends to dry cakes out). You can assemble the whole thing a couple days in advance! Please let me know about the flour!! So curious to figure this one out. Hi Shabeen! If freezing just the cake layers, add the cordial after they are thawed. Fantastic recipe. I’m making this for my brother’s wedding next year. I’ve practiced a few times and found that my layers are a bit thin too. I’m in the UK and used self raising one time and plain with the baking powder the second. Does all purpose flour have anything added? I’m going to try self raising and baking powder next time I try. Hi Leyla! Ugh, that is a good question. All-purpose *should* be the same as plain flour (it doesn’t have anything added to it), but it’s not and it’s not self raising. I tried baking a cake in Sydney using plain flour and it was thin and super dense. A few others have had this question to, it’s something to do with the type of flour, I just am not sure of the difference! Let me do some research and see what I can dig up. Bread flour has more gluten so probably wouldn’t work. I wonder whether cake flour might work – plain flour with corn starch – plus the baking powder. When I next try the recipe I will give it a go and report back! Yes, please let me know how it goes! I have just tries making this cake as a trial for my daughters wedding next year. I used themetruc measurements. It tastes divine, the buttercream is more yellow than yours though. I wondered is it possible to freeze once completed? Hi Janice! So glad you liked it. It’s possible your butter is more yellow than mine. You can try adding the tiniest bit of violet color gel to try and neutralize that. You can totally freeze it! I made this cake today in preparation for a wedding shower. It came out delicious. I think think the elderflower is not strong tasting, a hit if floral. , it was light. Tasted lots of lemon. Anyways I am excited to make a shower cake this co inv weekend. Thanks for the recipe. So happy to hear you liked it Judy! I made this cake twice and it hardly rose at all—my layers are maybe 3/4” tall and extremely firm. Not dry but pretty dense. My baking powder is new. Maybe I overbeat, but I was pretty careful. Do you know of anything else that would account for such thin layers? Hi Melody! Were all your ingredients at room temperature? And are you in the UK by chance? What flour did you use? Hi, this cake looks beautiful! I have a question before I attempt it, how on earth do you get your swiss meringue buttercream so white? What brand of butter do you use? I am in the UK and our butter is usually quite yellow. I have tried using the palest I can find and adding a tiny hint of violet but it still comes out quite ‘creamy’ coloured. Any tips? Hi Tamara! I use Natrel butter that I get from Costco and I do add a touch of violet if needed to whiten it up. It’s not pure white though still, just the slightest bit of cream color. One thing you could try is whipping your butter before adding it to the meringue to lighten it up in color. I keep meaning to try this but haven’t had a chance yet. Curious if it would work! I baked this cake at 350 degrees for 20 mins (because I wanted to rotate them 1/2 way through), and after 20 mins they were burnt! I can’t image they’re supposed to bake for 45 minutes. Is that a typo?? Please advise. Hi Dena! Mine took about that long to bake — three 8″ cakes with baking strips on them in the oven. Did you use 8″ cake pans? Perhaps your oven runs a bit hot. They should not be burnt after 20mins! I questioned the 45 min. as well and baked for 30 and mine came out very browned on the sides and dry. The cake itself, in final state, was beautiful. However, once sliced and served I found it very dry. Thoughts? Loved the elderflower (I used St. Germain). Found gorgeous camellias for the top. Hi Kara! Everyone’s oven bakes a bit differently. For me, baking all 3 layers at once, it took that long. I always recommend checking the cake throughout the baking process and adjust baking time as needed. You could always add more syrup too if needed! Can you please tell me where i can buy the stand in QLD Australia? What is the name and brand of it as well please. Hi Summa! I actually bought it at a discount store here and it didn’t have a brand listed, just a Made in India tag. This recipe looks much less complicated than others I have found. I need to adjust this recipe for a wedding cake of 2-10″, 2 – 8″, and 2 6″ layers. How many batches of this batter would you recommend, and what would be the baking time adjustments for the larger and smaller pans? I made this cake last night. It’s delicious! I followed the recipe exactly and it turned out perfectly. Thank you! I can’t wait to make it again. AND try more of your recipes! This looks amazing and I can’t wait to try it! How many people do you think this cake would cater for? Hi there! The cake serves 16 or so, traditionally sliced. Hi Joy! That just means they have links that you can click on. Your cake looks beautiful! I’m with you – I love the simplistic/rustic look with fresh flowers that Claire ptak has mastered. 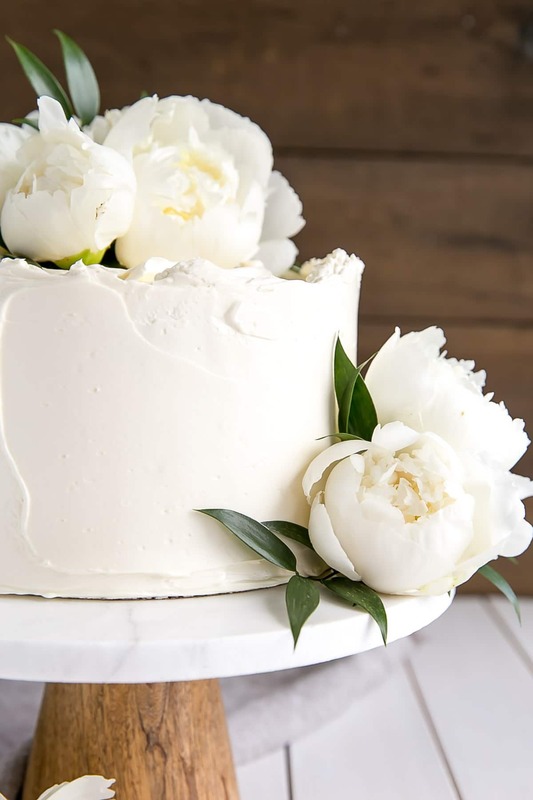 I would LOVE a decorating video of how to frost a cake like this – I still struggle with frosting and decorating my cakes. Love your site and recipes – thank you! Thank you!! I haven’t checked, but I wonder if Claire has a video of how to do this on her Instagram? Sorry, me again. I forgot to say that I rap the filled cake pans on the counter 3 times (gets rid of large bubbles) before putting them into a 325 degree oven, and my cake layers come out flat every time. Oh, wow! 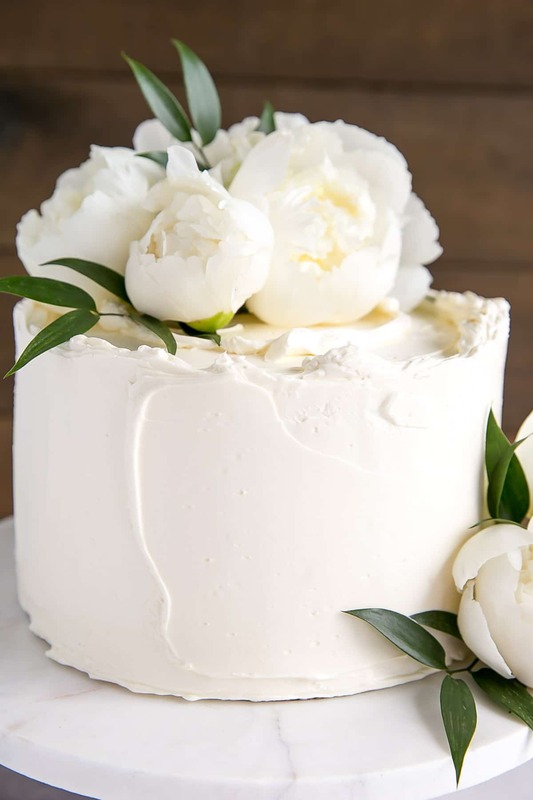 I, too, fell in love with the royal wedding cake and copied the design for a wedding cake I was making for a friend to feed 250-300 people. I didn’t make the lemon elderflower cake, but used a white sour cream cake recipe I have and made a plain vanilla butter cream. 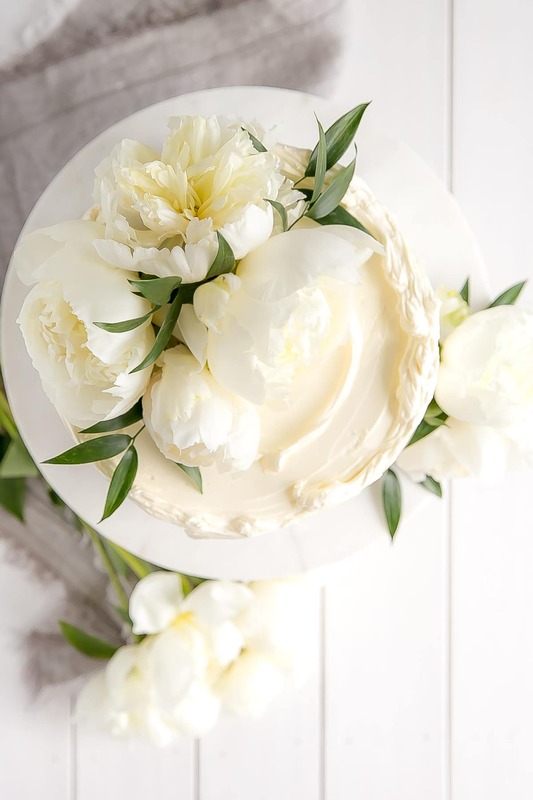 It was gorgeous (after the florist added the flowers) and tasted wonderful, but I couldn’t get that pretty swirled edge like you got. I thought maybe it had to do with the Swiss meringue icing consistency, so I made some for my mom’s 89th birthday cake. Still didn’t get the pretty swirled edge and thought the Swiss meringue tasted like a stick of butter. Also, it takes so long to make. I can’t possibly imagine making 16 recipes of it for the wedding cake. Would you please make a video of you icing the cake so we can see the icing technique that makes the pretty edge? Can’t wait to try the cake recipe! I have a question about the Lemon Curd. Do you measure out the 1/2 cup of freshly-squeezed lemon juice? Or just use whatever you get out of one large lemon? I ask because I measured out the 1/2 cup; not only did that take over 2 lemons to get to, but my curd has stayed very runny and juicy even after 3 hours of chilling. You are the best for answering so quickly! Yay!! Glad to hear it came together!! Hi – I live in a high altitude area (5,800 ft). What adjustments, if any, do you recommend? Thank you Olivia for your link advising about quantities per tin size it is most helpful. Thank you for sharing your wonderful recipe. I was so excited to try a version of the royal wedding cake. I ordered the elderflower cordial immediately after the wedding. I looked at the bottle everyday and was a bit intimidated by using it. I searched the internet for a good recipe, and came across yours. Your elegant cake immediately caught my attention. I made a smaller version of yours. It came out excellent. Everything from the buttercream, curd, and cake was explained in very easy to follow directions. It was a fun experience for me. Thanks again.. Thanks for the awesome recipe, I adapted it for cupcakes and they turned out absolutely delicious! Due to your thorough comments, my first time making Swiss meringue buttercream went off without a hitch! For cupcakes, I made 1/2 the cake recipe, 1/4 lemon curd, and 1/3 buttercream. It was perfect for making 12 cupcakes. I also used the Elderflower syrup from IKEA. I bought the IKEA Elderflower but have read it was too seeet. Did enough Elderflower taste come through? Hi Ellen! I bought the IKEA Elderflower drink concentrate and ended up using about 3 Tablespoons total (for 1/3 of the buttercream recipe). I added one T at a time, then tasted. I did not dilute or alter the concentrate in any way before adding to buttercream. I thought it was the perfect amount that allowed the Elderflower flavor to come through without being overpowering. I did not find it overly sweet, but I did also use salted butter on accident as I wanted to use the higher quality European Kerry’s Gold (and did not realize it was salted), so maybe that balanced it out? Either way, my recommendation would be just to add 1 Tablespoon at a time and taste it until it is to your liking, that way it’s not too sweet for you. Also, it will taste less sweet (and in my case, not salty anymore) after chilling in the fridge as opposed to eating it at room temperature. Hi there! 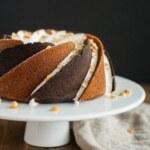 This recipe looks amazing and I can’t wait to try it out, however I need to make the cake gluten free. Is it possible to just substitute gluten free AP flour? Hi Ashley! I think a GF all-purpose flour blend would work fine. Could I sub cake and pastry flour and add an extra 1tbsp per cup, or does the ap flour provide more structure for the cake? Also I have two 10″ cake pans and want to try this as a two layer only. Do you think there is sufficient batter to accommodate? I have just found your recipe for the Elderflower cake. Am I able to use the buttercream as the base before adding a mirror glaze icing? It’s for a 30th birthday. Many thanks in advance. Hi Margy! I’ve never used a mirror glaze before, but I suspect it would be fine. Hi, Olivia. Thank you for sharing the recipe. I just made this cake for my daughter’s 12th birthday, and I have to tell everybody that read this recipe, “please, give it a try to this cake, you’re going to love it, believe me, it’s soooooooo delicious and elegant at the same time” sorry for my spelling, I’m from Mexico. I just made this and brought it into work & it was a huge hit – even though it didn’t look as good as yours! I did have some problems assembling it. I only used a little more than half of the lemon curd and still the layers keep sliding around and the curd oozed out. And my icing was nice and stiff until I added the butter, then it got too loose (and flattened) to really maintain the moat to keep the curd in. I’m wondering what I might have done wrong – (plus there was lots left over.) I used a ton of frosting but there was still enough leftover to do another cake. It did taste great, but I’d like to do a better job next time. Hi Debs! I’m so glad it was a hit! Re: the soft frosting, this is not uncommon — it’s usually due to either butter being too soft and/or the meringue still being a touch warm. A 20min session in the fridge and then rewhipping should bring it all back together nicely 🙂 Oh and the recipe makes enough frosting to fully frost the cake, in case people didn’t want to use the curd after all. Hi Laura! My guess is that it would be plain, but I used plain flour myself once (using a different recipe) when I was visiting my sister and it didn’t turn out. It’s definitely not self-raising flour though! This looks great! I’ve been looking to make a copy of this cake. I was wondering, does the cake needs to be kept refrigerated? Thank you! Hi Debs! I always refrigerate my cakes, but it should do fine at room temperature for a few hours. I would refrigerate overnight though. Thank you! I did! Turns out a refrigerated cake is great on a 95 degree day anyway! Hi Stephanie! The curd and buttercream both freeze really well if you had a lot left over. This cake looks (and I bet tastes) gorgeous!!!! It’s absolutely stunning and very elegant. I am from Mexico . Even here i couldn’t find elderberry cordial I replaced it with mezcal . Great recipe . Everything worked perfectly. It is very hard to find a perfect recipe . Thanks for sharing. Thanks so much Teresa, I’m glad you liked it! I made this cake for Julie Richardson’s birthday (author, Vintage Cakes + rustic Fruit Desserts) and she was wow’ed. So was I – it is delicious and beautiful too. THANK YOU! I was not shy about “brushing” the cakes with a St.Germain simple syrup – the cake was moist and wonderful. I’m wondering what the difference would be if I had just brushed it straight up with St. Germain? They baked in half the time specified and I only used a fraction of the lemon curd and half the buttercream. MAKE AHEAD: I made the cakes and buttercream a few days ahead, wrapped the cakes and put them in the freezer, covered the buttercream and put it in the fridge. Thawed the cake the morning of, warmed up the buttercream quickly in a double boiler and whipped it back into silkiness. We draped a cascade of sweet peas over the top and down the sides to great effect. Hi Lauren! I think it would be fine to brush it with straight up St. Germain, but it would be more potent (nothing wrong with that though! ), so it just depends on how strong you want the flavour. Strange that they baked up so fast for you! Maybe your oven runs warmer than mine. I’m so happy to hear that everyone liked it!! I made this cake and it was a hit! Can it be frozen? Hi Darlene! Yes, it freezes quite well. Hello, for how long this cake can sit at room temperature? This recipe/ flavour would be great for wedings, baby showers, birthdays, you name it. My only worry is egg yolks in the curd, even though they’ve been pasteurized. Thanks! Hi Mila! It should be ok for a few hours at room temperature. This cake is so gorgeous! and it must taste incredibly. Besides your pictures are to die for! I made this cake, and it won me the office bake off!! I was astounded at how good it was. I used IKEA elderflower concentrate for the buttercream, and had to use twice the amount recommended, but it’s a huge bottle so no worries there! I will say, I wish the instructions for the buttercream and lemon curd went before the cake, as a help for recipe-challenged people like me, who tend to miss the “sit for 3 hours” at first glance. Also, I messed up the cakes the first time by putting in 1 stick of butter instead of 1 cup- you might consider writing it out both ways for oven-incompetent. That said, kerfuffles aside, I love this cake, and I would totally make it again. This cake looks absolutely gorgeous!!! I’m planning on making it this weekend. In terms of the cordial, how do you know when the cake is sufficiently coated/soaked? Hi Jay! I dip a pastry brush into a small bowl of the cordial and generously brush it on. You don’t want to pour it over and soak the cake, but you want to make sure the flavour is there. If I had to guess I’d say I use about 2-3 TBsp of syrup per layer or so. 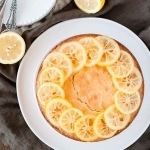 I just like the way you have shared the lemon elderflower cake recipe. Thank you so much for sharing the recipe for this cake. I want to make this for my Aunt’s 25th wedding anniversary next month” so this weekend I tried to make it and shared it to my friends. They loved it! But I heard someone said that it was dry. I don’t think it was dry but I think it was dense but moist. Is the cake supposed to be dense? I would love you to hear from. Thank you again! Hi Jinging! The cake should not be dry (especially if you used the syrup) or dense. A dense cake is sometimes due to overmixing, so be sure to stop as soon as the flour is incorporated. Also, spoon and level your flour, don’t scoop it up. This can greatly affect the amount of flour in a recipe. Thank you for your response. I always have issues with over mixing. It’s always my problem 😊I guess I should be careful next time. The flavor was excellent. I have another question. How long can you store lemon curd in the fridge. I had so many leftovers and I would like to use them next month if it’s still ok. Thank you again. Lemon curd lasts a couple weeks in the fridge but it freezes really well! i have never used whole eggs in lenon curd, just yolks. Hi Deborah! You can use just yolks if you like, but in pastry school we used whole eggs. Both works! Hi Olivia, this looks amazing! My friend wants this for her wedding cake so I’m so happy I found this and now I can practice. Can I use American butter cream instead? I’m not a fan of SMBC. Hi Lauren! For sure, American buttercream would work just fine. Looks lovely! Even though it’s pricey the St Germaine liqueur is delicious and makes fab cocktails! I was going to try replicate the wedding cake so thanks for doing it! Hi Raj! Mine are 2″ deep, but 3″ would work fine. The layers are on the thinner side for this cake. Ikea carries a really nice elderflower syrup. Can’t wait to try this! Just made this recipe as cupcakes (for a potluck) and the lemon curd is cooling to fill the cupcakes. I totally see why these flavors were chosen for the wedding cake. AMAZING! Also, thank you for the lemon curd recipe…so much easier than I thought! FYI…elderflower cordial is at Save-On in Edmonton. So glad you liked it! I got my cordial at Save-On as well! 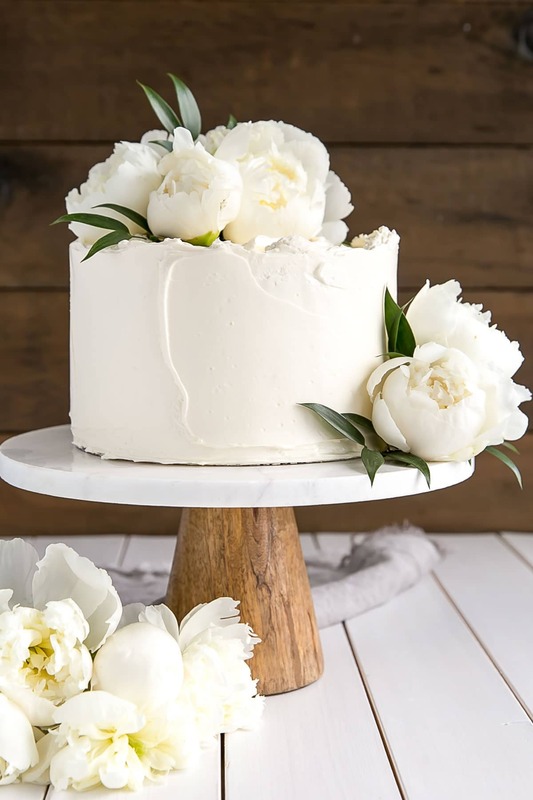 Where is this cake stand from? Thank you for taking the time to develop this recipe. I’m so excited to make it to bring to a lemonade stand themed baby shower. I even found the Elderberry cordial at my local home goods store! Thanks Tanya!! I will check youtube 🙂 I hope you and your mom like this cake as much as I do! THANK YOU So much for doing this. I was just going to kind of wing it, I’m sure this version would be fantastic. I can’t wait to try it. Olivia for the win!!! This sounds wonderful! I wanted to try and make this cake as well when I saw the chef advertising it. However, now I don’t have to figure it out, you’ve done the leg work. I can’t wait to try this! I was literally looking for this recipe yesterday! I can’t wait to make it! Also, if you did buy the St. Germain it’s great in a gin a tonic, just a bit for an extra something special . Olivia not sure if you check old post comments, but I made this cake the Rocky Road Bundt Cake, and yes the OCD way I put the different colors in just as you did one swirl at a time, and the homemade marshmallow cream and my husband loved it. Now his birthday is 2 days and I wanted to make him a peanut butter chocolate cake just like this one but in layers. Would I use the same recipe and just put it in a cake pan or would I have to adjust anything? I am doing one layer peanut butter one layer chocolate and so on. Thank you so much for posting such a beautiful cake and delicious one at that. It will be a 4 layer cake with peanut butter frosting on the peanut butter layers and and chocolate frosting on the entire outside of the cake. I know this post has nothing to do with this recipe. And this cake looks beautiful and sounds wonderful I will try it like I have most of your cakes. But the bundt cake was posted I think in Jan. left this comment on that post but no answer. I would like to make the cakes part tonight if possible. Thank you so very much for all your wonderful recipes tried a lot of them and loved them all your a wonderful baker. Thank You Olivia, I knew you would 🙂 just wasn’t sure you would see the old post in time. Thanks your the best. In the states, liquor stores carry the small/travel size bottles Elderflower liqueur so you do not have to buy a big bottle. Your cake looks so beautiful! I think I might actually attempt this recipe. I have a question–you write “since you need to dilute it,” but do you mean, you DON’T need to dilute it? Sorry for the confusion! I updated the post. Basically if you were to use the cordial in drinks or something, you’d need to dilute it. You can’t drink it straight up as it’s too potent. I hope that makes sense!! Just ordered the elderberry cordial from Amazon. When it arrives I will make the cake! Your recipes are foolproof and so delicious!! Thank you! why coat top of layer with buttercream before adding curd? Hi Jim! It’s just a preference, I like to protect the bottom cake layer a bit from the curd seeping into it. Wow, Olivia! This is such a gorgeous, elegant and royally perfect cake. I loved watching the Royal Wedding so this is absolutely perfect. Thanks so much Cindy! I only saw snippets of it but totally wish I had watched the whole thing.